Diverse teams of students build a stronger school culture by working together on service projects to address community needs. At my school, ACTION stands for Assisting Communities Together; Inspiring Our Neighbors. ACTION is a student-led initiative to fight hate and intolerance through community partnerships and purposeful acts of kindness as diverse groups of students work together. Our program encourages a team approach that supports college, career, and civic life by pairing middle school students with career mentors. Attention is given to finding mentors in professions that match the teens’ talents and interests. Each team identifies a specific need in the community, researches the topic, and then designs and implements a service project that relates to the students’ career aspirations and solves the problem they identified. Our projects are intended to inspire unity in our middle school and beyond as the groups work together to tackle challenging issues. Together, we demonstrate love in action. 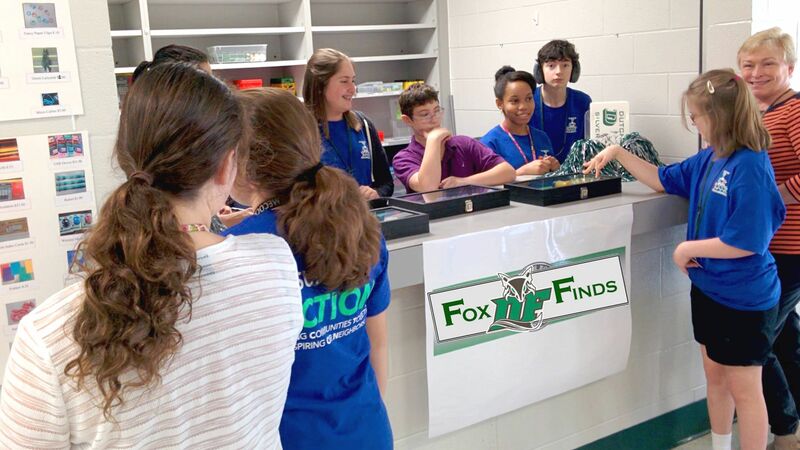 Last year, students with and without disabilities collaborated on two unified projects. Abigail Mojica, a special education teacher, served as the mentor for the School Store Team, which included 14 ACTION members and 11 students with special needs. It was a diverse group that included white, African American, Asian, and Latino students. The ACTION students learned about challenges facing students with intellectual and physical disabilities, and each of Ms. Mojica’s students was assigned an ACTION buddy. With adult supervision, the students learned various job skills such as advertising, ordering, inventory checking, selling, restocking, and customer service. A grant provided the funds needed to purchase our supplies: Chromebook chargers and covers, headphones, and a variety of school items. The school store was open during lunch three days a week, and student groups were assigned shifts. Four ACTION members worked each store day with their project buddies. A student project manager created the schedule and collected the inventory sheet at the end of each month. ACTION members scheduled their own substitutes when needed. Everyone understood their role on the team. Ms. Mojica set educational and social goals for her students, and served as the mentor by modeling teaching strategies so that ACTION members could properly assist their peers. My job was to guide the ACTION members through the design model as they planned, acted, and reflected on their team participation. I also served as liaison between my students and the special education staff. We formed a second unified team in the spring. This time, students with and without disabilities partnered with Karen Jackson, a water resource agent from Clemson Extension. For the first meeting, Ms. Jackson provided a hands-on experience to teach the team about plants and animals that are native to South Carolina. The team then went outside to assess the outdoor classroom. Ms. Jackson proposed several possible projects, including a rain garden to solve the water runoff problem, and she told me about a grant opportunity and wrote a letter of support. After this, the Outdoor Classroom Team met four times. First, Ms. Jackson helped students research best management practices for dealing with stormwater. Next, the team determined that a bioswale would be a better solution for the outdoor classroom’s mud problem. Ms. Jackson provided the team with data about possible plant choices. During the third meeting, students selected the plants and designed the garden. Using the grant money, Ms. Jackson helped us purchase the plants before the final meeting. The students, teachers, and Ms. Jackson then worked together to plant the bioswale. ACTION’s team approach can be adapted and carried out by secondary teachers in a variety of school settings. We’re expanding our ACTION teams this year, but although each team has a unique purpose, the approach remains the same. First, widen students’ knowledge base by bringing in experts from various fields. Mentors serve as role models who demonstrate acceptance, partnership, and leadership while gradually releasing responsibility to the students. Next, allow students to explore possibilities before deciding on a plan of action. Encourage them to use critical thinking skills to address issues in a meaningful and respectful way. Throughout the entire process, build relationships among team members. Provide a safe environment where all ideas are heard and individuals are valued. ACTION is committed to the whole child—educating both the mind and the heart. To combat hate, empathy must be strategically developed in our students. We choose projects that are of high interest to a variety of students and seek to attract mentors who represent diversity. Unity occurs when diverse groups work together toward a common goal.